* (Frank M. & his wife Grace is of the John Hoyt Line, not related to any Simon Hoyt's. Nearly all Hoyt's that lived in Amesbury, Mass. were of John Hoyt lineage). 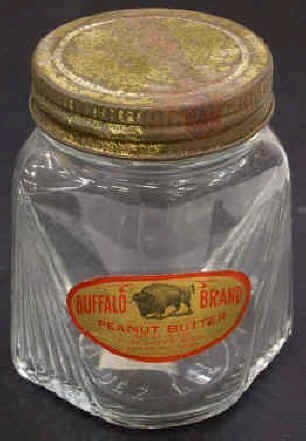 Frank M. Hoyt ground his first bag of peanuts into peanut butter in 1902 in a hand mill, During his visit to the World's Fair in Buffalo NY, he decided to name his brand "Buffalo" His first year's sale was a thousand dollars. 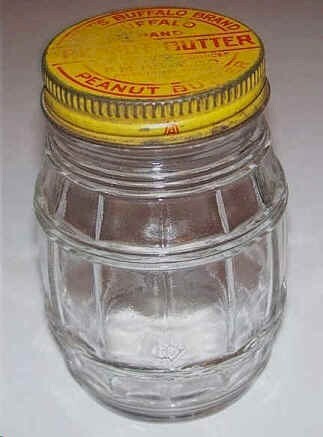 He moved into the wholesale business and branched out into several varieties of peanuts and candy. By 1923, he was selling his brand of products throughout North Amnerica and eight other foreign countries. His containers are highly sought after and command premium prices. 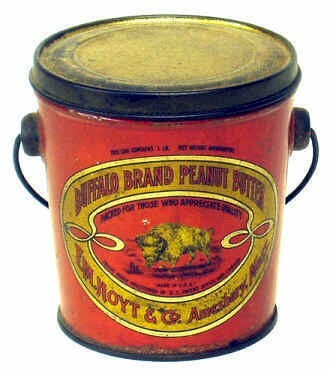 Hoyt Brands of peanuts and peanut butter were packaged under three different trade names, Buffalo, Pickaninny, and Powow. Buffalo with the Buffalo logo was the earliest and most common. It was packaged in a large variety of containers in one, two, five, and ten pound containers. 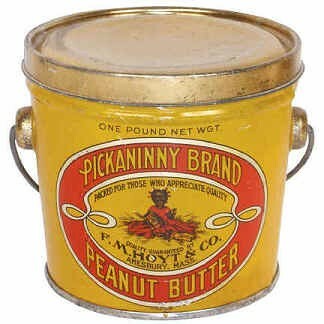 Pickaninny with a black child logo was second and scarce. It was packaged in one and ten pound containers. The Powow brand had an Indian chief for its logo and was packaged in ten pound containers. These containers are very rare and expensive on today's market. 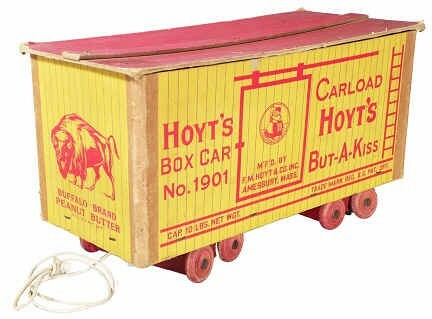 His Butta-Kiss candy was one of the most popular brands in the country and they could be seen sitting on grocery and candy stores counters in a five and ten pound cardboard freight cars. These were there for convenience of small quantities. 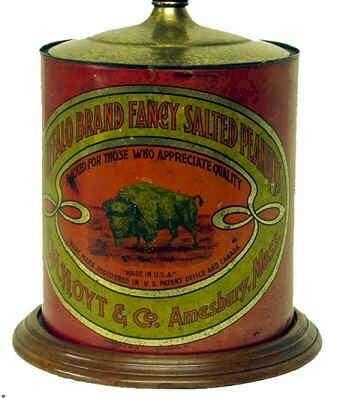 A large Buta-Kiss tin container was always present for customers who wanted to purchase a larger amount to take home. 1n 1925, the Amesbury Rotary Club was chartered with Frank M. Hoyt as a member and he became its president in 1928. 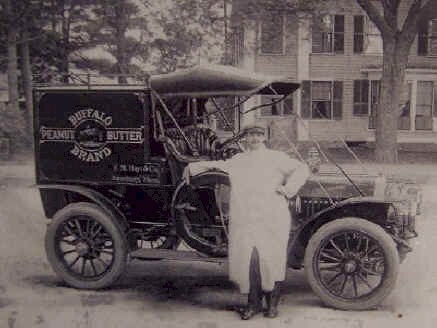 Frank M. Hoyt's Buffalo Brand Building in Amesbury, Mass. The item in this column of the May number, regarding F. M. Hoyt & Co., Amesbury, Mass.. was not entirely correct. 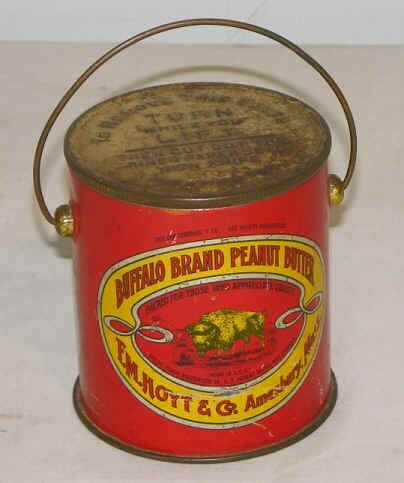 The business of this concern, who manufacture the "Buffalo" brand of peanut butter and fancy salted nuts, has so outgrown its present quarters that they are forced to get more room. 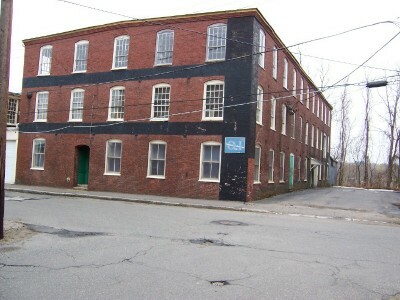 Mr. Hoyt decided to buy a plant which could be arranged to suit his conveniences and recently purchased of the Shields Carriage Co. their three story brick manufacturing building and the land which extends from Carriage Ave. through to the B. & M. railroad. It is an ideal location for Mr. Hoyt's business, being so near the railroad that it will be possible to have an elevator at the rear of the building down to the tracks of the B. & M. so that the large amount of freight of the firm can be handled without any teaming. It is Mr. Hoyt's intention to do a large amount of work in alterations and equipment of the new plant for the manufacture of the "Buffalo" brand products, for which it will be exclusively used. The new plant will give the firm about four times as much floor space as at present, and where the firm now employ 40 girls, they expect to give employment to 100. H. S. Lamb, formerly of the Keystone Telephone system of Philadelphia, has entered the employ of Mr. Hoyt and will be the general manager of the plant. It will probably be several months before the business will be moved to the new plant.